LeBron James? Tiger Woods? Lance Armstong? Michael Phelps? All respectable nominations, but the greatest athlete of our time hails from the world of professional eating. 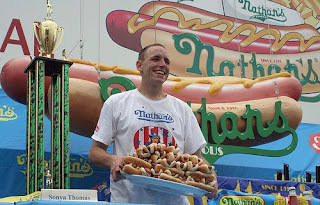 Earning his third victory in a row in the Nathan's Famous Fourth of July International Hot Dog Eating Contest, Joey Chestnut set a new world record by eating 68 hotdogs in 10 minutes and didn't need an overtime to handily defeat rival Takeru Kobayashi this year. Chestnut adds this world record to eighteen other such achievements in catorgories as varied as gyoza, matzoh balls, and Pizza Hut P'Zones. Take that Usain Bolt. Sure, you can run the 100m in 9.69 seconds but how many hot dogs can you eat while you're doing it? Hats off to Joey Chestnut, greatest athlete of our time. If a photo surfaced of Chestnut smoking a bong, would that be considered to be performance enhancing? If eating contests are one of the stupidest events in the world, writing a blog post on one is ______ ? So if eating contests are stupid, and writing a blog post about one is "______," then what words are possibly left to describe leaving a nasty (and utterly unproductive) comment after willfully reading said blog post? Perhaps Fork & Bottle is looking to start a food blog war, which to me seems more ______ than any of the above. I'd fight, but I'm already in training for next year's contest at Coney Island. Forget you, Jack, I'm calling out Joey C. It's on. All work and no play makes Jack a dull boy. It's obvious that someone here takes himself much too seriously. While Coney Island may not exactly be a gourmet food destination, I think that contests such as these are great spectator events where people can enjoy themselves with good company. You could argue that any spectator event is stupid, from the World Strongman Competition to the Tour de France to the Olympics -- however, in doing so you would be in tiny minority and completely out of touch with society. I guess being out of touch works for you, but as for me... I'm a multisport athlete, so I'm planning to saddle up on the couch, grab a juicy Nathan's Hot Dog and watch Lance race for his 8th.